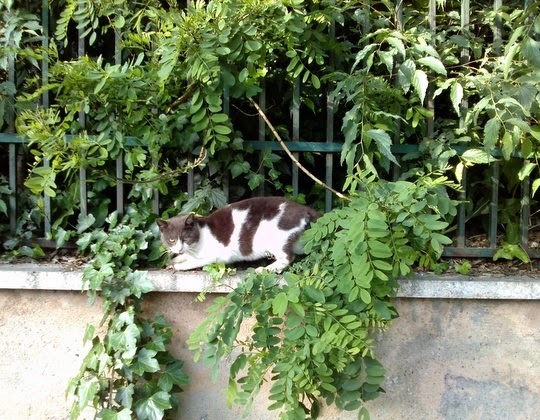 Traveling cats spotted at Villa Borghese in Rome, Italy. Just behind the cats is the zoo of Rome: Bioparco. By the way, if you look well, you'll notice that the first cat has a gecko under its paw. You must have good eyesight. a gekko !!!! snax time purrhaps :) !!! 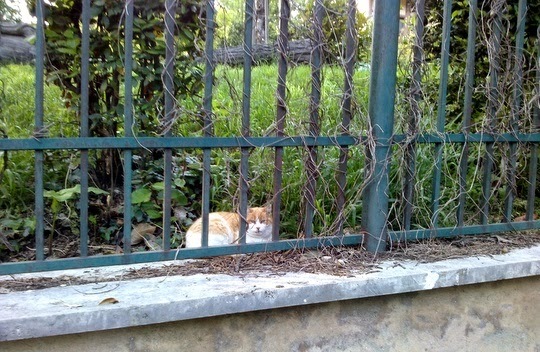 Ah les chats en Italie !!!! Ceux là ont un bel espace vert ! Such cool cats and great shots! Meow! Lovely Rome. Have a terrific Tuesday. Such lovely green space for kitties to play in. Cool! A gecko! I can't see it, but i'm sure the poor gecko is dinner for that kitty now! haha! Yum, a gecko din din! I guess he has his snack for the day. Super pics. Love the greenery. Cheers!! He must have been hungry! We don't have geckos, but I wish we did!! MOL Great pictures! We were wondering about the posture of that first kitty. The gecko explains everything! So sweet, loving these Rome posts!